The primary wood is birdseye maple with the staves rims and handle of white oak. There is a false bottom which is turned and woven. It covers 4 pegs for spools of thread. 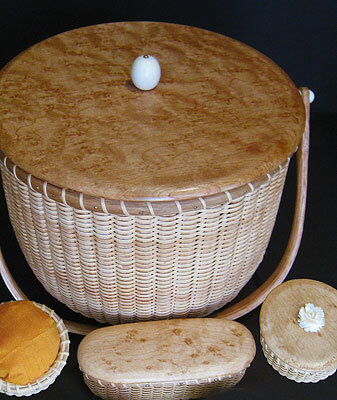 There are two small lidded baskets and a basket pincushion also. The inspiration for this basket came from the beauty and utility of the old Shaker sewing baskets. I do a great deal of custom work and someone suggested the sewing basket. She was a needle worker. One of my daughters thought it was also a great idea but the girls are more interested in function and "pretty" and they do very little sewing. That is the source of the title of the piece. Since many young women do buttons, snaps and some hemming I added little baskets for organization of pins etc. It all gets hidden under a lovely piece of figured maple. This basket has been well received by the younger generation which is a goal going forward for myself and many of my folk art friends. If you sew a little and love baskets this may be a gift to yourself you are worthy of.